We rarely cancel classes due to weather. Check your email to be sure. 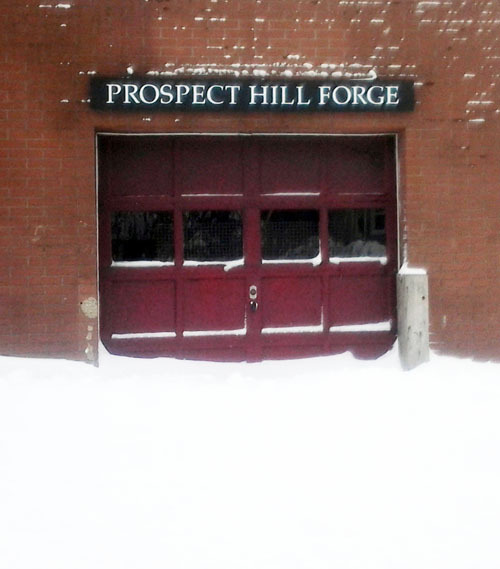 Carl and Willow both live close enough to the forge to get here on foot in whatever conditions there are. If there is a class scheduled, we'll be here. If you can get here without being stupid (endangering yourself or others, driving illegally...) feel free to come. We'll do something to make it worth it, maybe run the class, maybe do other smithly things. Do not count on a plowed place to park. But, there is probably-not-plowed off-street parking in the fenced-in lot across from 58 Guinan Street (the grey two-story building just up the street). If your vehicle can cope with that, that lot's a good spot for it. If the power is out, that's another thing. Without power, we have no lights, heat, or, and this is vital, ventilation. So, if you're expected for class and we've lost power, we'll try to reach you, but feel free to reach us first ( 781 81 oxide) and we'll figure it out. If they say all classes are cancelled, our class is cancelled too. Call them at 617-547-6789 to find out (it'll be in their greeting message).